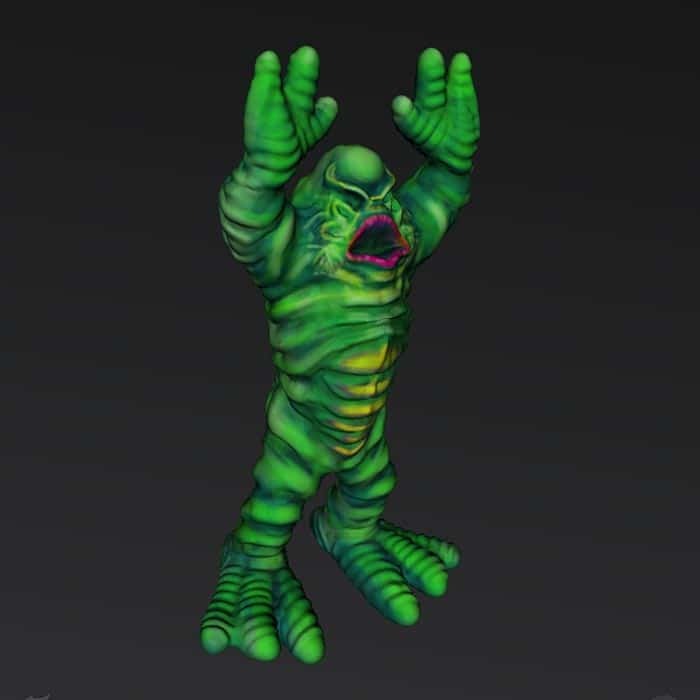 Our designers have gotten to take a closer look at the new 123D Creature app from Autodesk and are churning out some really great stuff. 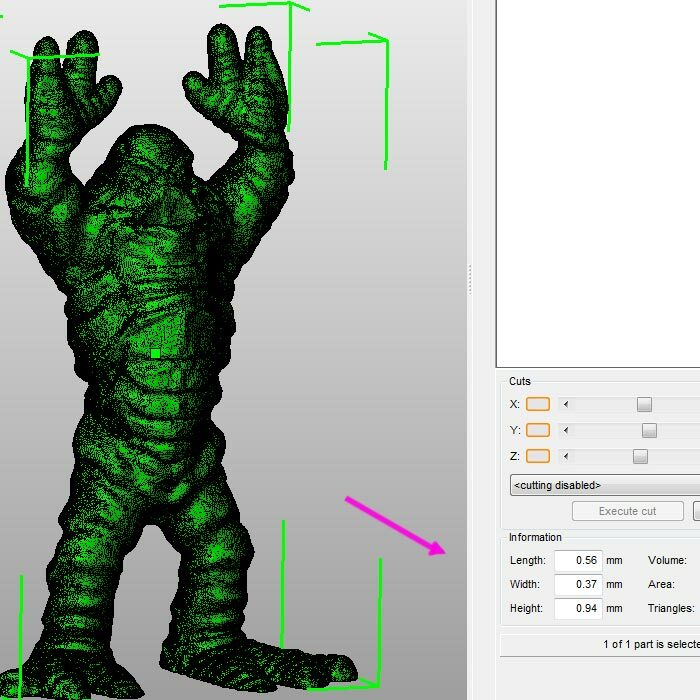 Essentially what we have now is a tool to sculpt any kind of figure on a screen, export it, and make it on a MakerBot. 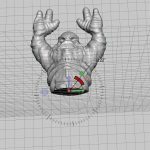 How you use the app is up to you and your imagination, but we thought we’d offer you guys a step-by-step of the workflow once you have your design. 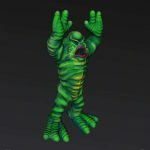 Click below to see all the steps, and please, for the love of monsters, leave comments and tell everyone your own tips. 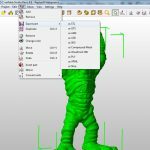 Before you go through these steps, you’ll want to have MeshMixer and netfabb running on your computer. 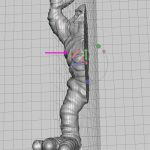 Click on the thumbnails above to see larger images that relate to steps 1-4. 1. 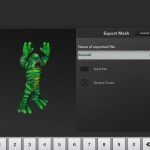 Create a Creature on your iPad app. This is what our designer Jason came up with. 2. Click through menus and select “export mesh”. 3. 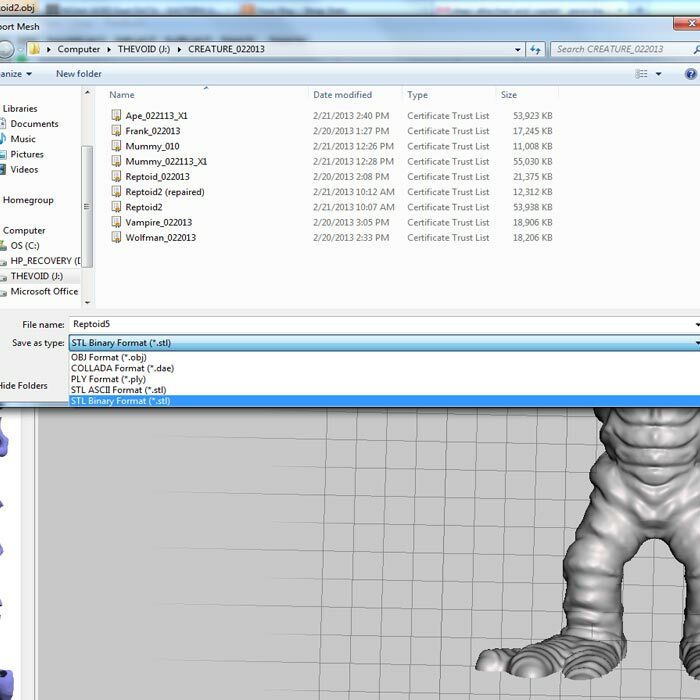 It might help to rename your file, since Creature will always name your file the “My Creature.” Once you’ve done this, click “Email File” and send it to yourself and do all the normal things you do when you download a file: save it to your desktop, unzip the files, and rename the .obj to your desired filename. 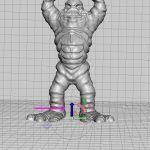 It’ll automatically be named “sculptshape.obj.” 4. 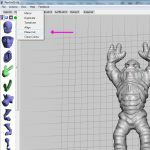 Open Mesh Mixer and import your file. 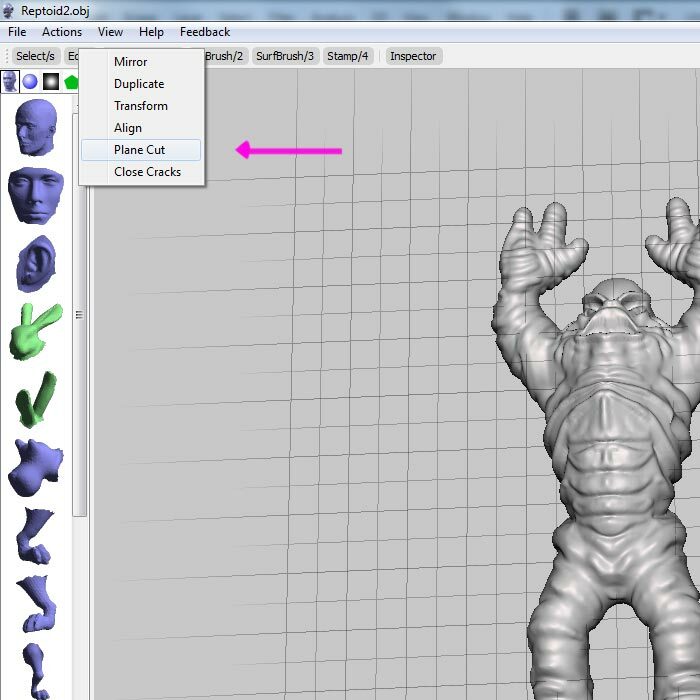 Tip: while pressing ALT, use your left mouse button to change the view of your model. Click on the thumbnails above to see larger images that relate to steps 5-8. 5. 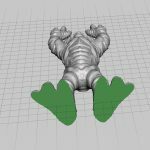 Now you want to create a flat surface at the bottom of your model so that it will print well on your MakerBot. Go to Edits and select Plane Cut. 6. You might have to change the angle of the plane by clicking the red arc and dragging with your mouse. On Jason’s model, we want the plane to line up with the bottom of the feet, so this vertical plane won’t do. 7. 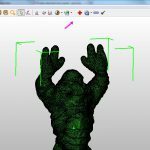 Guide your mouse around the compass to snap to a specific degree measurement. 8. 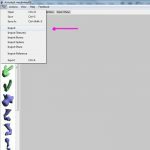 Drag the plane to the right place in your model by clicking the blue arrow. Click on the thumbnails above to see larger images that relate to steps 9-12. 9. You’ll want to make sure your plane is in the right place. 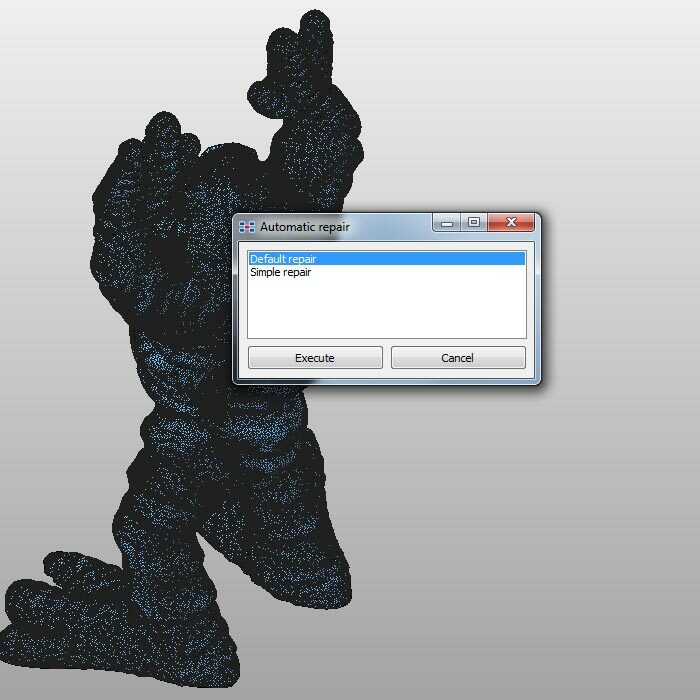 Press ___ and click your ___ mouse button at the same time to change the view of your model. Here we can see that the plane is in just the right spot to preserve the shape of the feet. When it’s right, click Accept, or press A. 10. 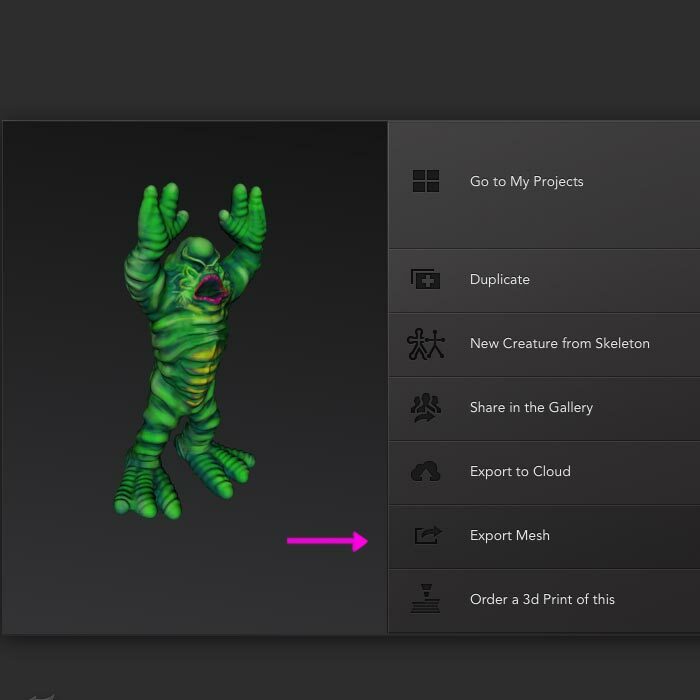 Export the file to your desktop or some easy location. 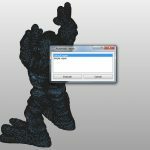 When saving, change the file type to .stl (either binary or ascii). 11. 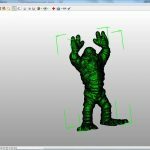 Now you can open your file in MakerWare, but in many cases, the model will be too small to see. 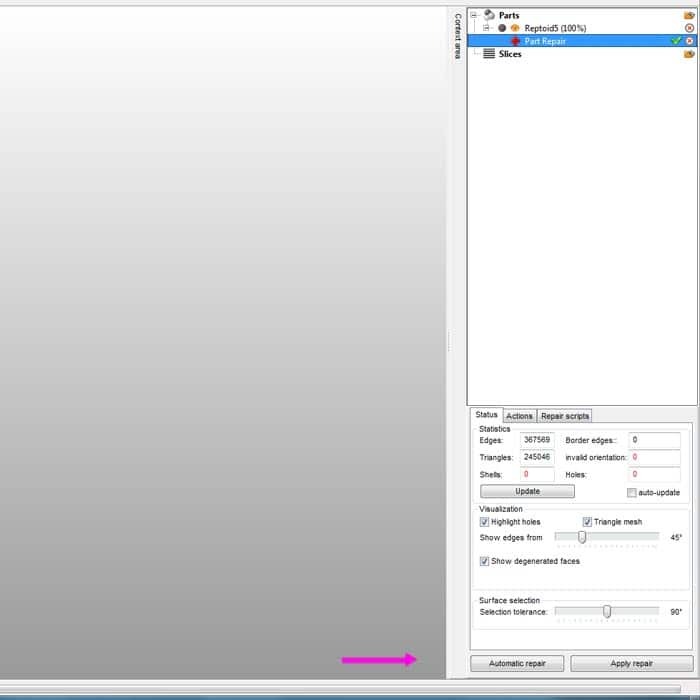 To get everything perfect first, open your file in netfabb. 12. If your model is not already selected (shown in green), select it. The dimensions should show up in the bottom right. 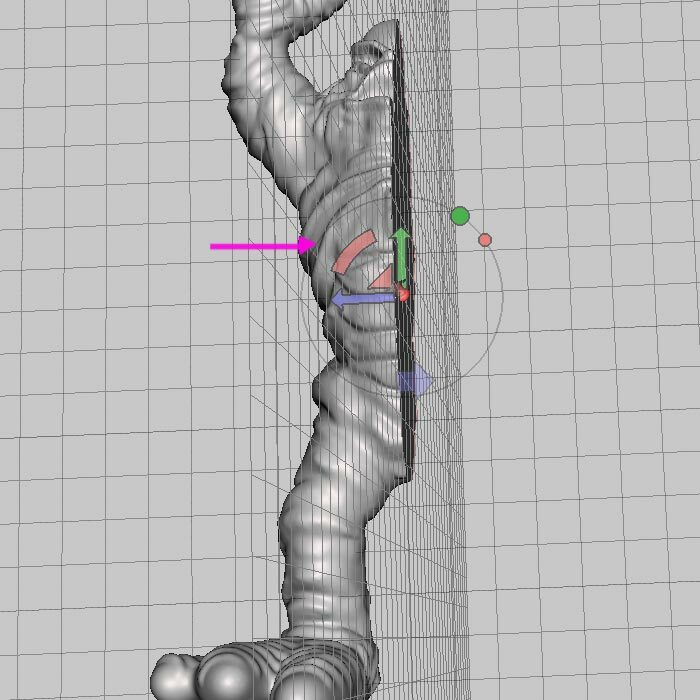 Look how tiny our model was when we first opened it. Click on the thumbnails above to see larger images that relate to steps 13-16. 13. 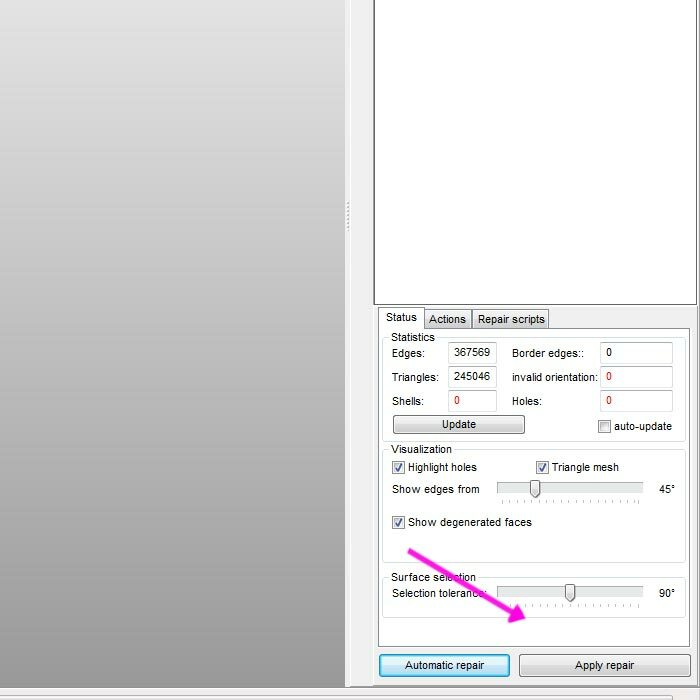 Now click Part and select Scale. 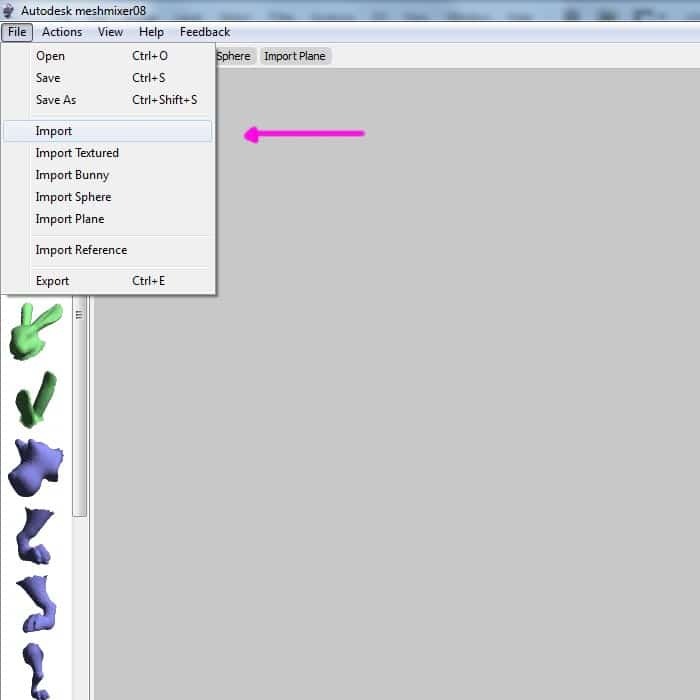 A dialog box will open up for you to adjust your model. 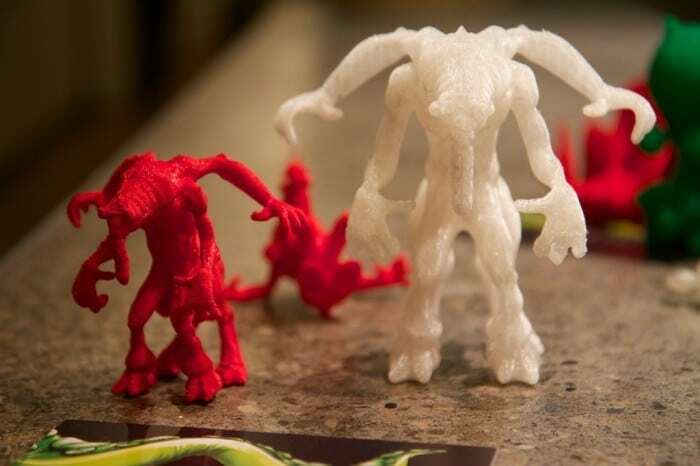 We made ours about 50 mm tall. 14. Click the red + button in the top tool bar. 15. Click automatic repair in the bottom right of your screen. 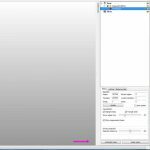 With this tool, netfabb will examine the mesh to make sure there are no fatal errors. 16. When the dialog box pops up, select Default repair and click Execute. Click on the thumbnails above to see larger images that relate to steps 17-20. 17. When the repair is finished, click Apply repair 18. 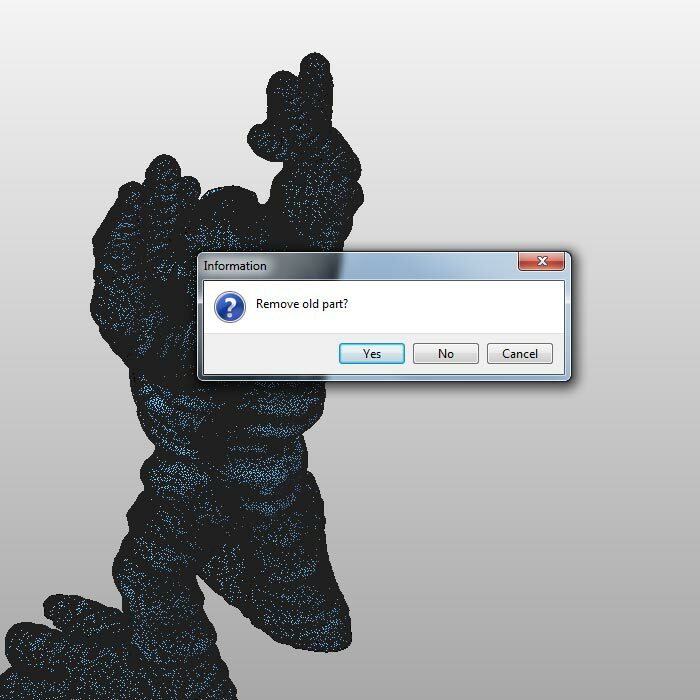 When the dialog box asks “Remove old part?”, click yes. 19. Your screen should return to normal view. 20. 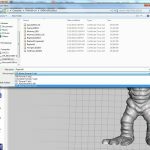 Now you’re all set to export your file from netfabb. 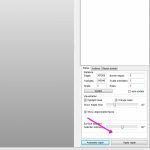 Go to Part on the menu bar, then Export part. Choose “as STL”. 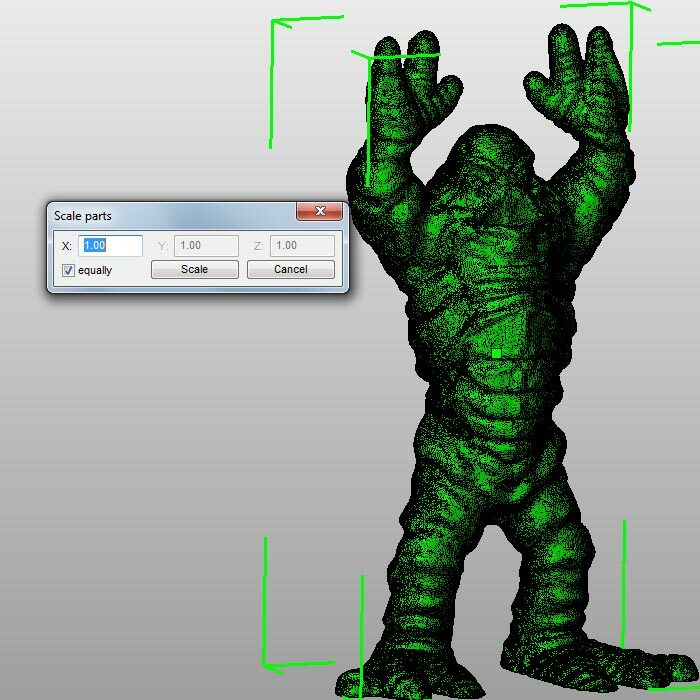 You could also export as an .obj, but we recommend .stl. That’s it! You can open your file in MakerWare and make it like normal. 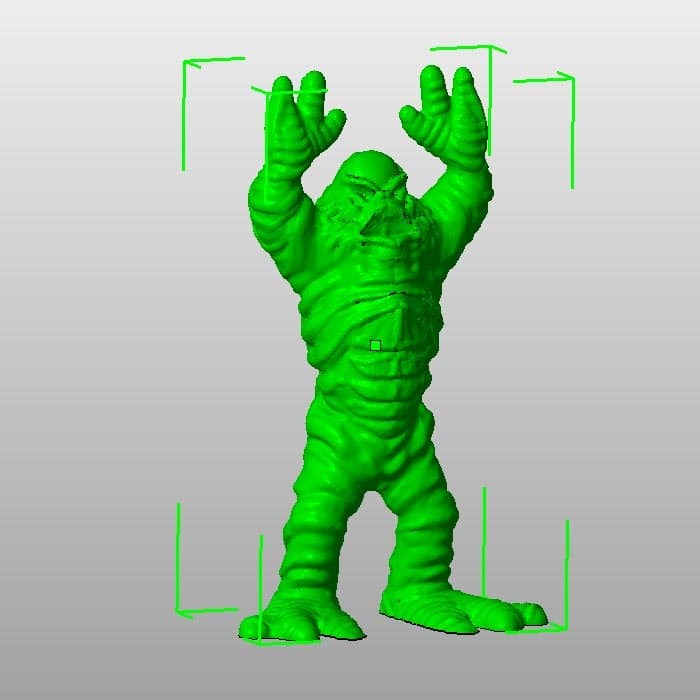 We have had some awesome results with 123D Creature here at the MakerBot headquarters. Now show us what you got. Upload your designs to Thingiverse and tag them “123D”.